It’s as you were at the top of the Premier Division supported by Sportsform after wins for the top two on Saturday. For current leaders AFC Oakley M&DH it was home win number five on the bounce with a 2-0 victory over Flitwick Town thanks to goals from Matt Barnes and Rhys Allen. Whilst for second place Renhold United, who trail them by just a point, it was a 3-2 win at Wilstead to end the hosts’ 11 game unbeaten run. Ashley Drummond netted twice and Mark Reed once against home replies via an own goal and Colin Marshall. 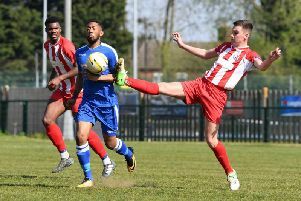 Despite this defeat Wilstead remain third following away defeats for both Ampthill Town Reserves and AFC Kempston Town & Bedford College. Town Reserves went down to a 7-0 reverse at Ickwell & Old Warden where Lee Threadgold netted five times to go alongside single goals for Andrew Vallom and Josh Cranwell. Whilst the College boys were beaten 4-2 at Marston Shelton Rovers. Jamie Cerminara with a hat-trick plus Jim Burraway were on the Rovers scoresheet against replies from Ashley Windridge and Mark Allen. Now up into sixth are Cranfield United who won for the fifth time on the bounce with a 6-2 home victory over second from bottom Eastcotts AFC. Jordan Appleton and Martin Holland scored twice alongside single strikes from Liam Whitmee-Craig and Luke Gray against Eastcotts replies via Luke Hyde and Kaylin Wilson. Also netting six were Pavenham with a 6-1 home victory over bottom of the table Elstow Abbey. James Owen with a brace was joined on the scoresheet by single strikes from Nick Payne, Tom Rodger, Darren Payne and Nick Cakebread against a lone Abbey reply via Antony Sammut. Elsewhere Shefford Town & Campton needed to come from 2-0 down to earn a point in a 2-2 draw at Caldecote. Andrew Truett and Sam Julian netted for the home side against Town replies from Adam Larsen and Nick Threadgold. The Sandy v Sharnbrook game was postponed. With league leaders Sundon Park Rangers away on County Cup duty Stevington now find themselves back in second spot and just six points adrift of the Rangers after winning 2-0 at Houghton Athletic thanks to goals from Martin Danobrega and James Bourke. Queens Park Crescents dropped back below them in the standings after being defeated 1-0 at home by Potton Town who duly ended their four game losing away run thanks to a goal from James Pyman. For Shefford Town & Campton Reserves it was a 2-1 victory at Riseley Sports to end a run of seven league games without a win. Malcolm Marimirofa scored both of the goals against a lone home reply from Sam Harrison. The Westoning v Ickleford game was postponed. For Sundon Park Rangers it was a 2-1 victory at AFC Dunstable Reserves thanks to a brace of goals from Shaka Anderson. Whilst AFC Kempston Town & Bedford College Reserves emerged 5-4 penalty shoot-out winners at Farley Boys after 90 minutes play had seen the teams deadlocked at 1-1. Chris Wright was the Town goalscorer. The Henlow v AFC Oakley M&DH Reserves game was postponed. With leaders Cranfield United Reserves having their game at Kempston Athletic postponed and second place Cople & Bedford SA also having to call off their home encounter with Clapham Sports now just three points behind them both are Lea Sports PSG who ran out 7-1 home winners over Wootton Village. Joe Hennem led the way with a hat-trick and he was joined on the scoresheet by Owen Malcolm, Jordan Yearwood, Richard Randall and Sean Dixon against a lone Village reply from Nick Burraway. Just a point behind the PSG in fourth are Flitwick Town Reserves who claimed their sixth home win on the bounce with a 6-2 victory over Kempston Hammers Sports. Benn Ward bagged a hat-trick and he was joined on the scoresheet by single goals from Sean O’Donnell, Mark Funnel and Scot Gadsden. The Hammers replies both came from Jimmy Grandidge, his 200th and 201st for the club. The one away victory of the day came the way of fifth place Atletico Europa who won 6-2 at bottom of the table Marston Shelton Rovers Reserves. That came via Tadji Jankovic with a hat-trick, Daniel Green with a brace and a single goal from Cameron Browne against Rovers replies via Gary Russon and Keiran Day. Wixams remain seven points clear following their 9-0 victory at White Eagles. Gareth White netted five times, Iain Hall three times and Charlie Battams the once. Whilst second place Sundon Park Rovers returned to winning ways with a 6-1 home win over AFC Dunton to end the visitors five game winning run. Chris Scott with a hat-trick was joined on the scoresheet by an own goal plus strikes from Nick Buttigieg and Craig Barnes against a lone reply from Tony Norman. This defeat saw AFC Dunton drop down the table into fourth spot and overtaken by Caldecote Reserves who won 2-1 at Shefford Town & Campton A. Simon Ashton and Carl Bilcock netted the vital goals against one in reply from Town’s Iain Holiday. It was also a good day on the road for now fifth place Wilstead Reserves who claimed their fourth win on the bounce with a 1-0 victory at second from bottom of the table Meltis Albion Reserves thanks to a strike from Luke Pursey. Elsewhere Sandy Reserves ended their eight game losing away run when sharing the spoils in a 2-2 draw at Dinamo Flitwick. Dale Goldie was on the scoresheet twice for the home side against replies via Aaron Seldon and Adam Hayes. With leaders Mid Beds Tigers sitting the afternoon out second place Polonia Bedford closed the gap on them at to nine points after they returned to winning ways with a 6-1 home victory over bottom of the table Lidlington United Sports. Filip Otocki led the way with a hat-trick and was joined on the scoresheet by Adam Chlapinski, Marian Sobczyk and Gabriel Kosinski against a lone reply from Andy Jeffs. Whilst now in third are Caldecote A who jumped above the non-playing Bedford Albion by claiming their fifth victory on the bounce in winning 6-3 at AFC Kempston Town & Bedford College A. Jack Stagg scored a hat-trick, Neil Giles a brace and Harry Elkins one against home replies via Lewis Smith, Matt Cheveralls and Giovanni Moscaritolo. Elsewhere lower down the standings Flitwick Town A swapped places with Henlow Reserves after recording a 5-3 home win over them. Stuart Ironmonger with a hat-trick and Stuart Kemp with a brace brought up the nap hand against replies via Andy Harvey twice and Sam July. Stevington Reserves will now face a trip in Kempston Hammers Sports for a last four tie after securing a 6-4 home win over Luton District & South Beds League side Farley Boys Reserves. Cameron Cain with a hat-trick was joined on the scoresheet by Aaron Fletcher, Sam Nightingale and Joe Khalums.